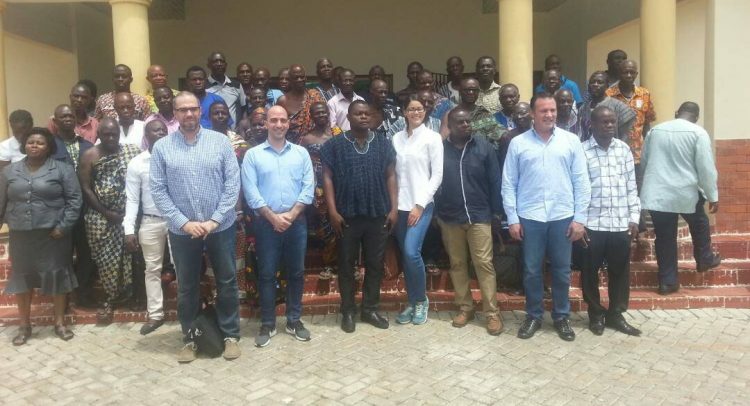 Palm Oil processing and extraction giants – Africa Palm Corporation (APC),in a bid to broaden the frontiers in its operations, has signed a new partnership agreement with the Ho West District Assembly to process and extract Palm oil from Palm fruits on a large scale for mass market consumption. A 5-man delegation comprising the President- Oscar A. Faria, Financial Officer, Marc Mesa,senior management member-Marielis Ontiveros,Carlos Gomez – Operations and country coordinator Raymond Tetteh paid a courtesy call on the District Chief Executive of Ho West , Hon. Apau Ernest Victor, and the traditional chiefs of the community to put finishing touches to the agreement process. In his opening remarks the Hon Apau Ernest Victor expressed his elation about the project and further elaborated on the Government’s desire to provide job potentials in Agriculture particularly for the youth through such initiatives. He further expressed the relevance of this project hinting on the benefits of its establishment in the Ho West District such as the provision of schools,health care centres and palaces. In his presentation, Country Director, Raymond Tetteh espoused the strategies and procedures that will be adopted in the execution of the project. He said the prime aim of APC is to partner the chiefs and people of the community to produce and enhance the Oil Palm plantation business by extracting palm oil from the palm fruits for the market. Mr Tetteh stressed on the need to harvest quality and organic fruits for the ready market. “Africa Palm Corporation is also ready to assist in the training of farmers in the newest methods of nursing palm fruit seeds viable for mass production.” he added. The partnership project also highlights the benefits the community will derive in the construction of new roads leading to farm sites,accessibility of water to farmlands etc. It is also envisaged that the value chain of this project will create over 40,000 jobs amongst the youth in the catchment area. Addressing questions from the Chiefs and Elders of the community, Mr Carlos Gomez emphasized that it is the expectation of Africa Palm Corporation to reap around 2.2 to 4.5 metric tonnes of the product each year. Mr. Carlos again hinted that the project ,upon the approval from the community elders, will kickstart in the next six months and is estimated to cover over 1million acres of land as a starter for the project. In a related development,APC signed yet another partnership deal with the community folks in the Central region of Ghana on a similar project.The agreement was signed on behalf of the region by Hon Nana Appiah Nuamah II, Chief of Twifo Traditional area and a member of the council of state. The partnership will fall in line with Goverment’s vision on the one district one factory agenda which will see both parties establishing a common goal in the production of palm oil and rice in the region. African Palm Corporation is an American company dedicated to the extraction,processing and commercialization in the international market of derivative products of African Palm.with support and advice from a prestigious UK based insurance broker,the model guarantees investor viability and profitability of the business. APC’s advance High Grade ranking from its Brokers ensures total annual profits regardless of any political change or climatic conditions that could affect production and sales of the product. The operations of the investor company will largely be expanaded in the West African sub region in partnership with local communities.